Spherical roller bearings have two rows of rollers: a common sphered outer ring raceway, and two inner ring raceways inclined at an angle to the bearing axis. The center point of the sphere in the outer ring raceway is at the bearing axis. 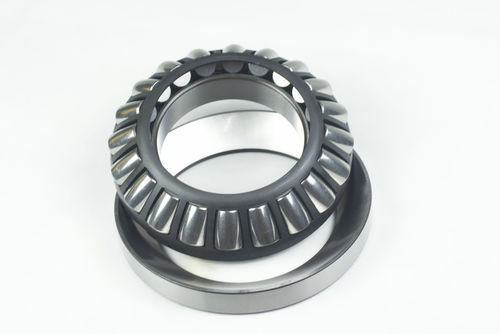 These bearings are insensitive to shaft misalignment relative to the housing, which can be caused by shaft deflection. Spherical roller bearings are designed to accommodate heavy radial loads, as well as heavy axial loads in both directions. THB Thrust spherical roller bearings have a self-aligning capability. These bearing models are mainly used in hydro electric machines, vertical motors, marine propeller shafts, and the like. THB Thrust spherical roller bearings have a dynamic load rating of C=465 KN.